While you might not think that there are any real dangers while using social media to brand yourself, you always have to be fully aware of the hackers out there. Yes, even trying to reel fans in on social sites like Twitter can make you a prime target of hackers. Facebook is another dangerous place to do business, along with even more professional sites like LinkedIn. There is a lot of risk out there. 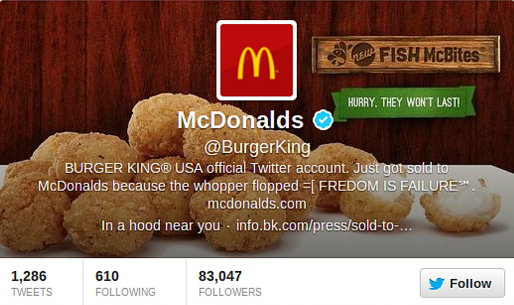 When Burger King decided to go to Twitter, they didn’t think that hacking was a problem. Well, they were quickly proven wrong. The same holds true for Jeep. These accounts were hacked when using Twitter. For larger corporations like these, the cleanup crews went to work instantly and the problem was fixed. But what if it was your brand? Could you stop the bleeding before some real damage was done? Social media advertising unfortunately makes you a target for hackers, even if you’re not operating a large brand. People will still try to target you for a wide variety of reasons. The best step you can take here is to prepare yourself for all risks. Burger King’s Twitter account was hacked to change the account description, name, profile picture, location, and website. If you’re not sure why hacking is so prominent on social media sites, the answer is simple. It’s because it’s so easy to hack people there. Individuals using these social sites are participating in the social experience by and large. This means they’re clicking on links, sharing items, giving out personal information, etc. For a hacker, this is like being a kid in a candy store. Someone’s bound to slip up and give too much information or click on a suspect link. Every so often, it just so happens to be a big business that falls into one of these traps. But make no mistake about it; smaller brands are falling victim to hacking tricks every single day. Are you protected against this sort of thing? What it boils down to when advertising on Facebook, Twitter and other social media sites is that you have to become informed. If you’re not ready to protect yourself from hacking, you may wake up one day and find that your identity has been stolen. There are all sorts of brand-crushing things that can happen in a really short time, like the hacker completely changing your page, spamming your fans, sending out nasty messages, getting into your personal emails and following the trail back to your PayPal or bank accounts, and other things you want no parts of. Click here to read more about paypal. If you’re willing to be cautious while using social networking sites, then the hackers are going to be powerless against you. Most of them on sites like Facebook and Twitter are only able to work off the information you’re giving or off of your gullibility in clicking suspicious links. Cut out that stuff and remain safe, and the main tools of social hacking are neutralized. Craig Robinson is a guest blogger for Advice Interactive Group. He works for Qwaya, a company specializing in dynamic Facebook marketing. Great tips Craig. Hackings are becoming more widespread and it’s important that we remain vigilant to stop them. It’s hard to believe that many people still use basic passwords and even go as far as choosing something detailed in the list of the top ten passwords used worldwide. Hackers are becoming more intelligent but we are still in the driving seat if we use our common sense. That’s correct Chris! I’m glad you liked the article.